Whether they're worn at the waist or at the hips, fashionable belts can add a fun splash of color or interesting pattern to any outfit. A belt can really bring your look together, flatter your frame and accentuate natural curves. Try adding a brightly colored or animal-print waist belt over a loose-fitting dress or blouse to give you that perfect hourglass shape. Many women make the mistake of owning one handbag for every occasion, which is a missed opportunity for enhancing your look. Handbags play a huge role in your appearance, so topping off your look with a mismatched or poor quality handbag can absolutely ruin an outfit. Be sure to collect a wide variety of colors, patterns and sizes that can work for different looks and occasions. Handbags are both fashionable and utilitarian, so you may feel a little less guilty about splurging on a great purse. 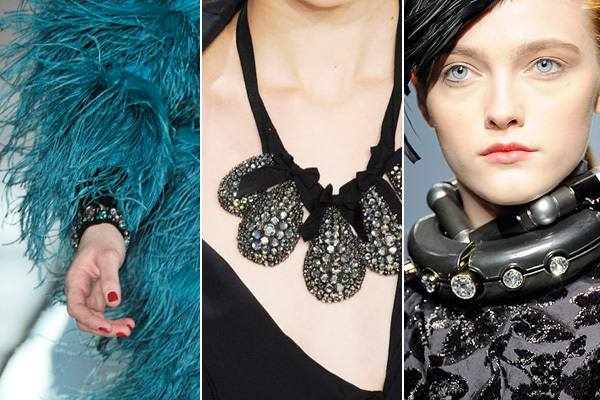 Statement jewelry is all the rage in the fashion world today, which is good news for fashionistas on a budget because these dramatic accessories can enhance your outfits in a big way. Whether you choose an edgy chain necklace, a bold bangle or sparkly chandelier earrings, just one piece of statement jewelry can take your look from good to great. Never underestimate the power of a scarf to liven up your look with both texture and color. Scarves can be worn in a number of different ways and a wide range of weather conditions, so you don't have to limit yourself to typical styles and blustery days. You can wear a bright, solid-colored scarf over fun patterns or vice versa for a look that really captures attention. A fun trick is to double up two thinner scarves for a chic and unique accessory. Headbands are a way to add whimsy to your wardrobe. A headband works especially well with a pixie cut, but it's also a great way to tame longer hair on high-humidity days. Choose a band with a bow or flower for a flirty feel, or a thin braided headband for a polished look. You may have to devote a bit more effort to pairing the right accessory with your outfit, but the more accessories you own, the greater your options for mixing-and-matching and creating fresh outfits. If you love your outfit, but feel like it's just missing something that you can't quite put your finger on, the right accessory may be just what you need to feel complete. Remember: When it comes to great fashion, the details are just as important as the main event.